I did enjoy my night at the Little River Motel, although while the bed in the back room was OK, if you plan to stay for any length of time I suggest adding a topper - there were some hard spots in the mattress. I had already booked a room in Moses Lake, and planned to hang around the Little River Motel until 11:00 (check out time) but the smoke was bad enough that I left around 8:00, just after breakfast. That made my arrival time in Moses Lake far too early to check in (11:00AM). I forgot that there would be another time change between the two stops. So, I decided to take a bit of a tour & punched Coulee City into the GPS. That added a couple of hours to the trip & let me see Dry Falls again. I stayed in the area on a 2014 trip, including a day at the city park and a couple of nights at the state park below the falls. It doesn't look and different, but I took a couple of photos anyway. They are a bit Smokey compared to the 2014 photos, but I included a panorama this time. The viewpoint still gives me a bit of disorientation standing at the end! Speaking of smoke, it got very bad just across the Idaho border, then gradually cleared as I drove into Washington. 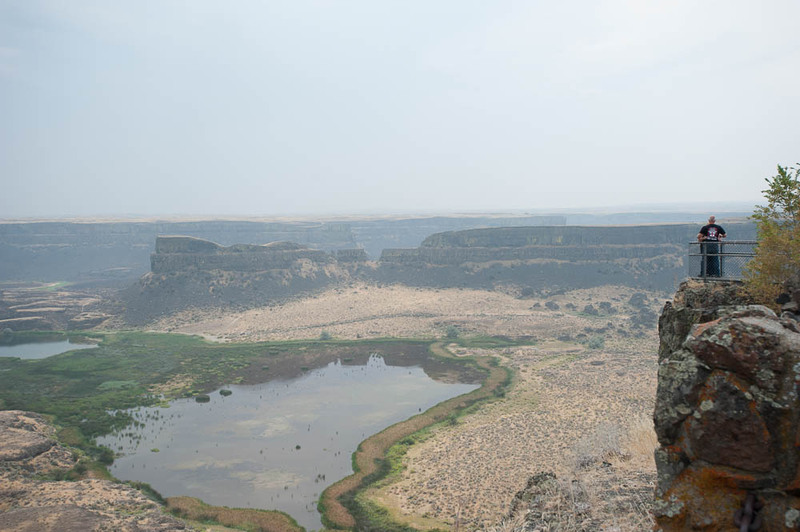 It isn't gone, as obvious in the Dry Falls photos, but my eyes aren't watering. I didn't stop at the Lenore Lake Caves along WA 17 on the way from Coulee City to Moses Lake - while interesting, they are not real caves & I already visited them last time. I don't remember WA 17 as being as rough last time, but is sure is lumpy now! I'm in Room 107 at the Motel Oasis Inn, complete with a sofa & king size bed for $85.12. I still arrived earlier than check in time (around 1:00), but the let me in with no complaints. There is a fairly large pool outside my door - I may try to do some laps before dinner. Dinner, well actually a late lunch, was a Subway chicken sub & my first of the trip Alaskan Amber beer. After lunch I headed for the pool. While not the official size pool where I do 14 strokes per lap, it was long enough that I could do 4-5. That's better than most motel pools that let me do 2-3.